Vietnamese blogger Nguyễn Ngọc Như Quỳnh, also known as “Mother Mushroom,” stands trial at a courthouse in Nha Trang on June 29, 2017. HANOI, Vietnam (AP) — A prominent Vietnamese blogger was sentenced Thursday to 10 years in prison after being found guilty of distorting government policies and defaming the Communist regime in Facebook posts and in interviews with foreign media, her lawyer said. 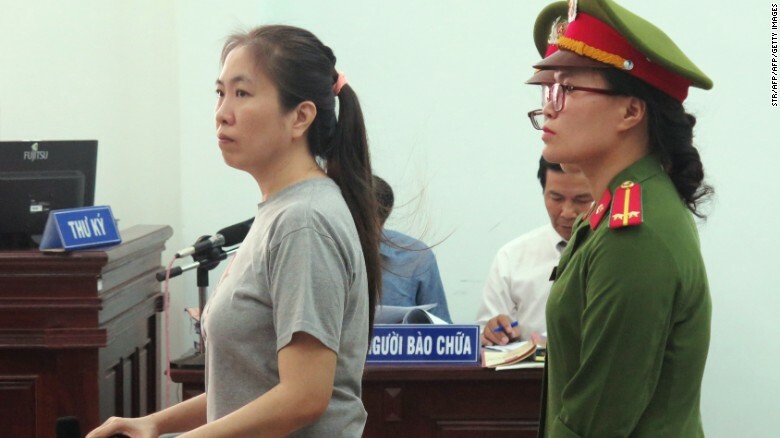 Nguyen Ngoc Nhu Quynh, also known as “Mother Mushroom,” was sentenced at the end of a one-day trial in the south-central province of Khanh Hoa, lawyer Vo An Don said. Her conviction related to the content of 18 articles on her Facebook page and interviews with foreign news outlets such as Voice of America and Radio Free Asia, Don said. Blogger Mother Mushroom campaigned against Formosa’s environmental violation: “Sue Formosa” (Internet photo). Quynh, 37, co-founded a network of bloggers and is very popular in Vietnam. She has written about human rights, civilian deaths in police custody and the release of toxic chemicals by a Taiwanese-owned factory that killed thousands of fish in one of Vietnam’s worst environmental disasters. Quynh, the single mother of two young children, maintained her innocence throughout the trial, her lawyer said. “Nguyen Ngoc Nhu Quynh did not admit that she committed any crime, saying she has a right to freedom of expression,” Don said. Don said the sentence was “too harsh and unjust” and that Quynh plans to appeal the verdict. Quynh’s sentencing drew a stern rebuke from the United States, which said it was “deeply concerned” about her conviction and those of other peaceful protesters over the last year. “The United States calls on Vietnam to release Mother Mushroom and all other prisoners of conscience immediately, and to allow all individuals in Vietnam to express their views freely and assemble peacefully without fear of retribution,” said State Department spokeswoman Heather Nauert. Quynh was arrested in October when she was visiting a fellow activist in prison. International human rights groups including Human Rights Watch, Amnesty International and Sweden-based Civil Rights Defenders have called for her immediate release. Responding to the calls for the blogger’s release, Foreign Ministry spokeswoman Le Thi Thu Hang said Quynh’s trial was held in accordance with Vietnamese law. “Like other countries in the world, in Vietnam, all law-violating acts must be strictly dealt with in accordance with the regulations of Vietnamese law,” Hang said at a regular news briefing. In 2015, Quynh was given the Civil Rights Defender of the Year award by the Swedish rights group. According to Human Rights Watch, there are about 110 known political prisoners in Vietnam. Vietnam denies it holds any political prisoners, saying only those who break the law are put behind bars.